*Contest ends 5/5 at midnight and winners (there will be TWO this week!) will be posted the following morning. Winners generated by random.org. Winners must notify annie@nickisdiapers.com within 1 week. Monkey Buns AIl In One Diaper ONLY $12.99!!! Spring Cleaning Sale!! Nicki's Diapers Madison Retail Store Saturday, May 8th Opening EARLY at 9am! FREE Car Seat Inspections from 9am-12pm in the parking lot! Prices SLASHED on all Graco car seats! HUGE Used Diaper Sale Prefolds * Covers * Fitteds AIOs * Pockets * Trainers Best Bottoms, Bum Genius, Thirsties, Sposo-Easy, Fuzzi Bunz, Blueberry and LOTS more! The winner of this week's weekly giveaway is Nick + Amber! 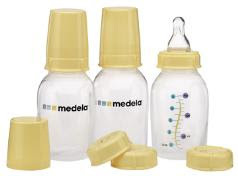 Congratulations, you've won a set of Medela feeding and storage bottles! Please email annie@nickisdiapers.com within 1 week to claim your prize! Congratulations to Sarah (author of the blog, Loving My Life)! You are the winner of this week's giveaway! You've won a Glamourmom Nursing Bra Tank or Glamourmom Nursing Bra Top, courtesy of Glamourmom, in your choice of size and color! Please email annie@nickisdiapers.com within one week to claim your prize! DryBees Pocket Diapers - SURPRISE SPRING SAVINGS!!! I get asked this all the time in the store… “If you knew what you knew now, and had to buy your cloth diapers all over again, what would you buy?” When I started cloth diapering my oldest son at 3 months, I bought an entire stash of Bum Genius 3.0 pocket diapers. Don’t get me wrong, these diapers are bulletproof and I still have a lot of fluffy love for them, but there were just so many diapers calling my name that I HAD to try. I later added prefolds and covers, and then the flood gates opened. In over a dozen different brands, I now have 40+ pockets and AIO’s, 10 or so fitteds, 2 dozen prefolds and a good selection of covers. *4 Dream-Eze organic cotton fitteds: the perfect nap diaper, very absorbent! *2 Snappis: no prefold-er should be without these! If you read the review earlier this week, you already know how much I LOVE Glamourmom Nursing Bra Tanks and Tops! Now is your chance to get your hands on one (or if you already have some, another one!) of your own! The winner of this week's giveaway is clgaarder! Congratulations! You've won two small Fuzzi Bunz Perfect size pocket diapers in baby pink and baby blue! Please email annie@nickisdiapers.com within one week to claim your prize! Planet Wise Swim/Diaper Bag - 10% OFF Gear Up For Summer!!! All "Items of the Week" run from Wednesday to Wednesday. When buying a baby shower gift or present for a new mom, do you have a go-to gift? For me, that gift is a nursing tank. I believe that every nursing mom needs a few nursing tanks in their wardrobe! Glamourmom was generous to provide me with a Nursing Bra Top for the purpose of this review. Nursing Bra Tops and Tanks made by Glamourmom are the essential piece of nursing gear for so many reasons. They provide great support and are comfortable enough to be worn without a bra! I often times recommended that our pregnant customers who come in looking for a nursing bra, opt for a nursing tank or top instead. This allows for fluctuations in cup and rib cage size without having to buy a new bra every few weeks! The same size nursing top can be worn throughout pregnancy (especially a Glamourmom Nursing Bra Long Top! ), into the first few weeks that your supply is stabilizing when your cup size may be larger, and then throughout the remainder of your nursing time when you're at a more consistent size. Glamourmom Nursing Bra Tops and Tanks are wonderful for new moms to take in their hospital delivery bag. Many hospitals don't allow patients to wear bras with metal hooks. A Nursing Bra Tank or Top would allow you to be up and moving around in comfort, but still allow you to nurse your newborn just after birth! Their also great for complete tummy coverage when you may be entertaining guests to your hospital but still want to be able to nurse your baby on demand. Glamourmom Nursing Bra Long Tops and Tanks are wonderful to have just after you baby is born and you're still wearing maternity jeans. They are long enough to hide the maternity panel and offer great support and style. Glamourmom Nursing Bra Tops and Tanks are very useful well into your nursing experience! My youngest son is now 10 months old and I still wear a nursing tank or top daily. They are perfect for layering and come in a great variety of colors that can be worn by themselves in the warmer months! So what sets Glamourmom apart from other nursing bra tanks or tops? So many things!! The inner soft-cup frame offers discrete nursing and enhances breast support. The mesh lining holds your nursing pads in place so you're never having to fish around for them after you're done nursing. 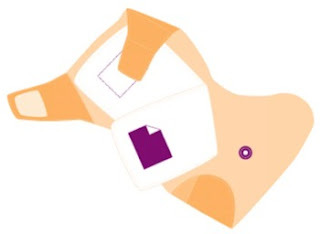 The clip is easy to use with one hand and the flap opens down for easy access. If you chose the Glamourmom Nursing Bra Tank or Long Tank, you'll notice the straps are the same soft cotton to match the tank and the clasps sit flush against your skin. They are fully adjustable! This is the perfect nursing to tank to wear on it's own. Most won't even know it's a nursing tank! This tank is available in sizes S-XL and comes in a wide variety of colors to match anything! If you chose the Glamourmom Nursing Bra Top or Long Top, you'll notice the straps are a little thicker and are made of smooth elastic. They are fully adjustable and have the traditional nursing bra clasp that matches the straps and tank. It is available in sizes S-XXL and has many colors to choose from! I'm so thankful that Glamourmom was kind enough to let me review their Nursing Bra Top! It's a staple in my wardrobe and I can't do wash fast enough to wear it next! It was perfect for layering in the winter, so comfortable to sleep in when my son was still nursing at night, and as it's warming up, I can't wait to wear it by itself in the summer! If you're looking for a perfect shower or mom-to-be gift, or you're just looking to spoil yourself, I highly suggest a Glamourmom Nursing Bra Tank or Top. You won't regret it! For your chance to win a FREE Glamourmom Nursing Bra Top or Nursing Bra tank in your choice of size or color, check back on Thursday for our Weekly Giveaway, sponsored by Glamourmom! Occupation: I currently stay at home with my children while laid off from a sales job. I will have to return to work soon, but I really enjoy being home with the kids to do activities at home and take trips during the week to places like the library or zoo. I wish it could stay like this forever. Children: Our daughter, Phoebe, will be three in May. Walter is five months old. How did you decide to cloth diaper? Is it bad that I can't remember? I'm pretty sure I had seen pictures of cloth diapered babies on a moms forum I frequent and decided to look into it. I know I did so much research before that first big buy. 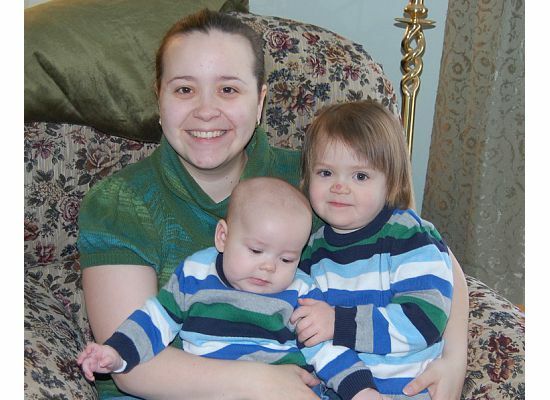 I loved the concept of saving money, keeping chemicals off my baby's skin, and helping the environment. 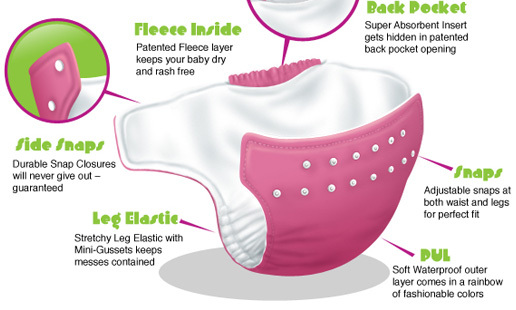 What types of cloth diapers do you use? Our very first diaper stash was a bundle of 12 Bumgenius one-size pockets when Phoebe was three months old. I love pockets the best out of all the types of diapers because I can completely customize them for the kids. They are what I know and work the best for us. I also have used them for daycare providers and grandparents because I find a pre-stuffed by me pocket diaper to be the most similar to disposables many are used to using. Over the two years we've used cloth, I have purchased some other kinds of pockets (knickernappies, fuzzi bunz, haute pockets, tweedlebugs and more) along with prefolds, fitteds (mainly kissaluvs and thirsties), and all-in-ones to try. What is your favorite cloth diaper and why? While I really love the prints and minkee on some diapers, I love my BGs. I now have the newer colors that were released after that first order and I've paid to have some of them converted to snaps since they don't currently offer snaps on the one size pockets. What is your favorite non-mommy related activity or hobby? I really love crafts. I paint custom shirts and have been trying to learn to sew. I'm still too scared to use my sewing machine if my mom or grandma aren't around since it's a really old Viking just like my grandma's and I think I'll break it. I've made blankets with tags for the kids and painted things like their Easter shirts this year. I enjoy it and it helps me relax after they go to bed. What type of music do you play in the car when you don't have your children? The difference in my car is only volume when the kids aren't there. Phoebe and I have sung along to everything from country to Lady Gaga. My guilty pleasure is Glee. I love playing the soundtracks and singing along. What would you tell someone who is just starting out cloth diapering? I didn't realize there was such a thing as a diaper trial like the 15 Day Wash and I didn't have any friends nearby that used cloth. It worked out that the diapers we chose ended up being our favorites, but there are so many options out there. If you want to start, try something like the 15 Day Wash or find a friend that might have a couple CD options for you to actually see and feel. And you need to use a cloth diaper friendly diaper rash cream or your cute CDs will end up with stains from it (much of our BG stash does now, but they still perform fine). I am a huge fan of LuSa Baby Moon Booty Balm. It won't stain, soothes diaper rash, and smells good. Anything else we should know about you? I have a tiny little etsy store where I sell my custom shirts and other crafts - elephantbubbles.etsy.com. Congratulations to stampedwithgrace! You are the winner of a Hotslings AP! Please email annie@nickisdiapers.com with your pattern choice within one week to claim your prize!